"History will be made when Nancy Pelosi is sworn in as the first female President in American history." Get ready for ... and the first female president of the USA. And to think this piece is written by a man. 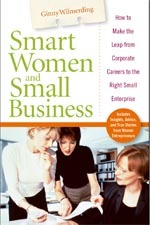 Babson's Women Business Blog post. They tire of hitting the glass ceiling and leave for smaller, private firms, said Judy Rosener, a business professor at University of California-Irvine, who has published books and articles on women at work. Rosener said it could take years or decades for women to reach the top of traditional large, publicly held companies, which she recommends female college graduates avoid. "A lot of really sharp women are saying their opportunities are better with fast-growing (private) companies," she said. Erin Fuller, executive director of the 8,000-member National Association of Women Business Owners, said women run nearly half of all privately held businesses. In the 1970s, it was less than 10 percent, she said. She said women are becoming more entrepreneurial because they can exercise control of a business, and it has become easier to get capital. Fuller said it wasn't until the mid-1970s that federal legislation guaranteed that a woman could have a credit card in her own name, and it wasn't until 1988 that Congress passed legislation that made it illegal for banks to withhold loans from a woman unless she had a man co-sign. Women Still Struggling To Break Glass Ceiling.